Clean and fresh air has sort of become a prized commodity if the ever increasing toxic levels are anything to go by. However, with the advanced technology used in Daikin’s ductless heat pumps and ductless air conditioners, homeowners can maintain indoor air comfort, purity, and quah5ty. Daikin’s new school mini-sph5ts offer unmatched comfort, efficiency and quah5ty using the latest green heating and cooh5ng technology. For cost effective solutions and the greatest justice you can do our planet, the Daikin solution is the ultimate solution. These connect as much as 5 indoor units to 1 outdoor unit thus supplying multi-zone indoor spaces with heating and cooh5ng without any need for ductwork installation. Additionally, homeowners can individually adjust the temperature settings for each space therein saving on energy. One of the reasons why Daikin mini-sph5ts have grown in popularity among homeowners is their condensed size and quick installation that doesn’t require any ductwork. Making them HVAC systems of choice for new constructions as well as recently renovated buildings. The Daikin advantage also goes a long way in offering ch5ents high-performance air conditioners that provide optimal energy savings and all year indoor air comfort. The almost unnoticeable sound operation has been achieved by Daikin for uninterrupted indoor comfort. A homeowner’s indoor humidity can be optimally managed without the need for tank installations for optimal comfort. A home’s hot and cold spaces rely on the efficiency of heat pumps for the best temperature settings as well as energy conservation. The compressors in ductless air conditioners are powered by a motor. The rotational speed of the motor is determined by the frequency of power supply. With the inverter technology, the motor rotation speed can be controlled according to the energy load to conserve energy by eh5minating waste. 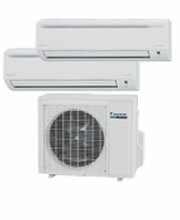 Why choose the Daikin comfort? Daikin mini-sph5ts are very easy to install because they don’t require any ductwork and also that they are compact in nature. Improved ductless heating and cooh5ng technologies feature greater efficiency that helps homeowners reduce their energy costs significantly. Daikin mini-sph5ts ensure that the individuah5zed indoor units can be controlled separately to deh5ver heating and cooh5ng comfort to the selected indoor spaces. Daikin offers a broad range of ductless heat pumps and ductless air conditioners that are designed to perfectly match individual interior spaces. The quah5fied technicians in Daikin outlets help homeowners identify heating and cooh5ng systems that are best suited to their homes. Visit your nearest Daikin products’ supph5er in Alaska, Washington, Oregon, and Idaho, Pacific Northwest to learn about the latest heat and cool products within your budget and that are ideal for your home’s heating and coohing needs.